Brittany is a region set in the north west of France and like most other areas of the country has distinct culinary specialties for which it’s famous both nationally and globally. Most famous of all Breton dishes I would say is the galette. A savoury kind of crêpe made from buckwheat and filled with delicious but simple ingredients. In the dessert sphere, there is the kouign amann, which is pastry sheets laminated in butter and sugar that caramelize as they cook. (The best version I’ve tasted outside of France can be found at the amazing Lune Croissanterie in Melbourne). The third famous dish, and the one that I’m showing you today sits somewhere between the two above as it is a dessert, but far less sweet than the kouign amann. It’s the Far Breton. Far Breton is a custard flan with tasty prunes (which have been soaked in rum or Armagnac) hiding at the bottom that is baked to form a gold or almost black shell on top. This recipe started life in the 18th century and was originally eaten completely savoury as a side to meat. It’s super simple to make but one tip I would give to achieve the most authentic result is to use the freshest (preferably organic) milk you can find, and, despite promoting using local produce most of the time, butter imported from Brittany or Normandy. The Brittany (and Normandy) regions make some of the best butter in the world and while we have high quality dairy in Australia, the taste just isn’t quite the same. Warm up the milk and cream in a sauce pan or microwave. Whisk the eggs, sugar and vanilla seeds together until slightly white and fluffy. Add the sifted flour and whisk until the batter becomes smooth. Pour in the warm milk and mix until combined, then add the rum. Pour the mix in the hot tin, put in the prunes and salted butter pieces. Bake in hot oven for about 1 ½ hour. Do not open the oven once the cake is in! Leave to cool in the tin at room temperature and enjoy with a cup of coffee or tea! Or the way I like it, is with a glass of Calvados! Watch the how to video below or visit my Youtube channel here to view more videos. If I had to describe brioche to someone who had never tried it before, I guess I would say that it’s a hybrid between cake and bread. It often comes in loaves just like bread, but as soon as you slice it you can see the texture is lighter, and more buttery, yet not quite spongy enough to be cake. It’s because of exactly these properties that the French class Brioche as a viennoiserie, along with pastries like croissants and pains au chocolat. The first written reference to Brioche was in the 15th century and though it’s origin isn’t confirmed, it’s generally believed to been a Norman creation (i.e. from the north of France). Savoury brioche is often eaten at breakfast in lieu of bread in France. 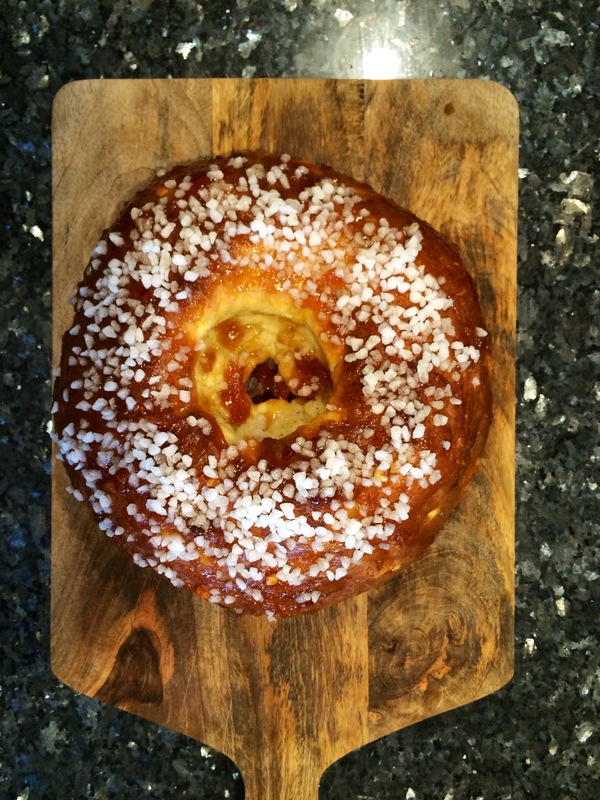 Sweetened varieties can be likened to Greek Easter bread, and in fact, my favourite kind of sweet brioche, called Mouna, is also served around Easter time. Mouna is traditional in Pied-Noir or Algerian cuisine, and because this is where my Mother was born, she has made it for Easter ever since I was born. You can use brioche to substitute for bread wherever you want to add a richer flavour and fluffier texture. For example, use it as burger or hot dog buns, or slather some cheeky nutella on top of a slice at breakfast, or, use it to make French Toast like many Aussie cafés are already doing. Place the flour, salt and sugar in an electric mixing bowl with the hook attachment (I like to use a Kitchen Aid) and mix the three ingredients together. Add the yeast to the flour and mix a little. Then add the eggs one by one and mix until combined. Knead the dough on high speed for 8-10 minutes to really work the gluten in the flour and give the brioche dough the strength and elasticity we want ( the dough should not stick and the sides of the bowl should be clean). Add the butter a little bit a the time, wait until the butter is incorporated before adding more! Knead for a further 5 minutes. Loosely cover the bowl with cling film and leave to rest until double in size. Then, knead the dough on a lightly floured bench to knock the air out of it and put it back in the bowl, cover with cling film and put it in the fridge over night. The dough will be easier to work with and have a better flavour by proofing slowly overnight. Take the dough out of the fridge and slightly knead it on a floured bench. Portion the dough in 100g balls, this recipe should give you about 10. Now you can form whatever shape you want, I chose to make buns with my brioche because I was having homemade Hotdogs for dinner! Place your Buns on a flat baking tray lined with baking paper, you may need to use more than one tray as we do not want them to close to each other. Loosely cover them with glad wrap and leave to proof in a warm spot until double in size. Brush the brioche with a couple of beaten egg yolk mix with a little bit of milk and sprinkle some hail sugar on top if you’re making sweet brioche or some sesame seeds for example for savoury brioche. Bake in the hot oven for 15-20 minutes, the brioche should be golden on top. Once cooked place them on a cooling rack and leave to cool. Tip: Do not let the yeast come in direct contact with the salt as it would kill it. We sing the song, and relish in raucously shouting the line “FIVE GOLD RINGS,” but many Australians would be surprised to learn that the classic Christmas carol “The 12 Days of Christmas” refers to the 12 days from Christmas Eve, not before it. What’s so special about the twelve days after? Well, this is the lead up a Christian holiday known as The Epiphany (6th January), which is still a public holiday in France and many other European countries. Now, the French aren’t known for being particularly devout, but we do love a public holiday, and especially one with a special dish attached. For The Epiphany, it’s the “Galette” (or Gateau) des Rois, which translates to “Kings Cake”, in reference to the Three Wise Men who are believed to have visited the baby Jesus on this day. I seriously doubt the Three Kings presented Jesus, along with their more famous gifts, a brioche-style, over-grown doughnut all those years ago, so I don’t quite know why we make “Galette Des Rois” in celebration of this event. What I do know is that it’s delicious and I’m sure Mary, Joseph and Baby Jesus would have loved it as much then as I do today. Galette des Rois are eaten from the 6th January until Mardi Gras (the Christian one marking the day before Lent fasting begins, as opposed to the Sydney version), and each one will often hide a little porcelain or plastic figurine somewhere in the dough. Whoever finds the figurine in their slice has certain privileges and responsibilities, which differ from country to country. Between countries there are also vastly different names and recipes for the Galette des Rois, even within France itself. Today, I’ve chosen to share the recipe my Mum used to make for my brothers, and me, which is known as a “Gateau des Rois”. Mix the flour, sugar and salt in an electric mixing bowl, like a Kitchen Aid for example. Mix the ingredients for a couple of minutes with the paddle attachment (the yeast can never be in direct contact with the salt as this would ‘kill’ it). Crumble the yeast and add it to the flour. Add the eggs, orange blossom water, rum, 80g of mixed peels and lemon zest and knead until you have a firm and elastic dough (about 5 minutes). Add the soft butter a little bit at a time and knead for a further 5 minutes. The sides of the bowl should be clean and the dough should be quiet soft. Cover the dough with cling film and leave to rest at room temperature for an hour or until it is doubled in size. “Knock back” the dough, that is, knead it for about 30 seconds and then cover it with cling film and place it in the fridge overnight. Place the dough on a floured surface and spread it using a rolling pin, just as you would do for normal dough. Fold it in 4 and repeat the process twice. Form a ball and place it on a flat baking tray lined with greaseproof paper. Dip 2 of your finger in the flour and stick in the center of the dough all the way down to the tray to create a hole. Carefully widen the hole using your hands. Reform the dough so it has a circular shape (a bit like a giant doughnut!). Wrap a pastry cutter or a stainless steel ring a little bit smaller than the hole in greaseproof paper, and place it in the center. That way the hole won’t close as the dough proofs. If you want to place a figurine into your “Galette”, now if the time by simply pushing it into the dough. Make sure you let people know what they may find in their slice before they tuck in! Cover with cling film and leave to proof for 1 hour. Brush the dough with egg wash (1 egg yolk mixed with 2 Tbsp water). Bake for 30 minutes. Then cover it with foil and bake for a further 15 minutes. Cool the “Galette” on a cooling rack until warm. Meanwhile, mix 2 tablespoon of marmalade with water and keep aside. Brush the “Galette” with the marmalade and sprinkle the pearl sugar and the remaining mixed peel on top. 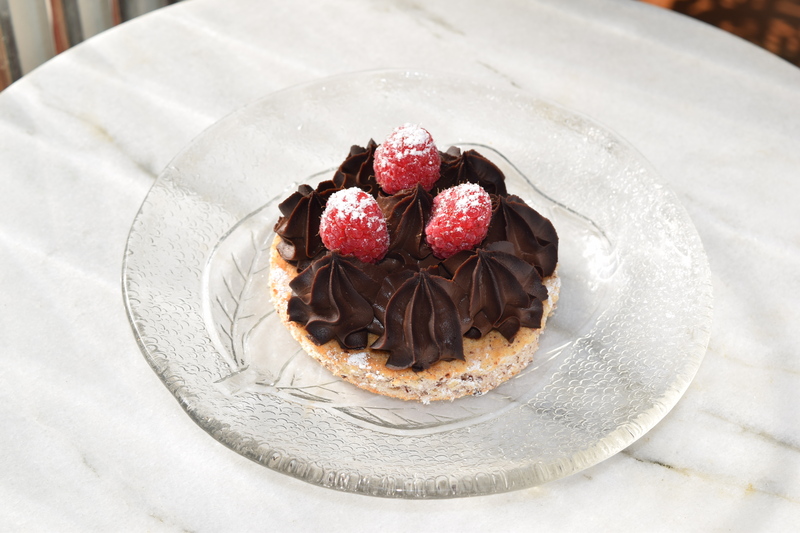 This delicious treat is now ready to eat for breakfast or for dessert. In French tradition, whoever finds the figurine in their slice has to make the next “Galette” to share!